4:00-6:00 pm, Tyco Visitors Center. Refreshments. 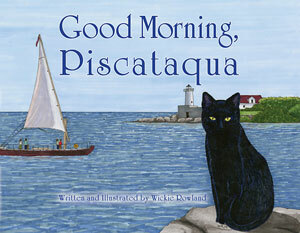 The adventures of Strawbery Banke's resident cat, J.D.—begun in the storybook, Good Morning, Strawbery Banke—continue as he travels down the beautiful Piscataqua River aboard the traditional gundalow Piscataqua. J.D. points out the fascinating sights on the shores in New Castle and Portsmouth, New Hampshire, and in Kittery, Maine, along the way. This second book by award-winning author and illustrator Wickie Rowland will delight young readers and spark their curiosity to visit the sites (and J.D.) in person.